Faith of our Fathers is a new series from The Humanist Lens authored by Jens Zimmermann, Canada Research Chair in Interpretation, Religion and Culture. The goal of the series is to emphasize the importance of understanding the church fathers for contemporary Christians of all stripes–especially when it comes to the difficult task of biblical interpretation. Enjoy! And please feel free to join the conversation. The theological foundation of Christian humanism is that God became a human being so that human beings could become godlike. This premise was first worked out in full by the early Christian theologians commonly referred to as “church fathers.” Early Christians called this the great exchange. God became human so that we could become godlike. This idea is also known in Christian theology as theosis or deification. Lest we think that this concept of deification is limited to Eastern Orthodox theology, I cite from our preeminent Western theologian, from Augustine’s homily on John: God became human “so as to make visible human beings into gods; the Son of God became the Son of Man, so as to make the sons of men into sons of God.” The goal of the Christian life is a constant education in Christlikeness. In other words, Christianity is a humanism because Christ has shown that God is quintessentially a “philanthropist,” a lover of human beings. If this is the theological premise of Christian humanism and thus a crucial factor in shaping Western culture, Christians and non-Christians should have a historical and theological interest in how these early theologians articulate their religion. Where and how did early Christian theologians find exactly this Christian humanism in the Bible? Is this idea contained in the Old Testament? Did Jesus ever say this? These questions show us that our understanding of the gospel very much depends on the way we interpret the Bible. We often do not realize how deeply our seemingly self-evident readings of the biblical text depend on a long history of tradition within which our own seemingly obvious understanding lives, moves, and has its being. How easily, for example, Christians refer to the Hebrew scriptures as the “Old Testament.” Already we are speaking out of a Christian interpretation about the relation between what early Christians called the scriptures and their fulfillment in Jesus the Messiah. We also rely on tacit assumptions when we talk about “the gospel.” What exactly is the good news? That our sins are forgiven? That our souls are plucked from eternal condemnation? Depending on our definition of “the gospel,” Christians shape their expectations for worship, preaching, church life and ethical conduct. “No problem, for the gospel is plainly expressed in the Bible.” Well, if it is, how do we explain the variety of readings evident even within Protestantism? Surely the preacher who preaches a gospel of obedience every Sunday finds this in the Bible? Adam and Eve committed the sin of disobedience, ruining God’s plan, wherefore he came up with plan B, sent Christ who kept the law, so that we can now obey the law again. The whole Christian life now revolves around sin-detection, sin-confession, sin-forgiveness for not keeping the law, and a renewed commitment for the coming week to try harder. This is not to say at all that Sin is not a serious issue, but should it be the sole or even central focus of the Christian life? We do not find this emphasis in patristic theology. Here we find an emphasis on God’s long-range plan for drawing human beings into the divine life by training his creatures in god-likeness or true humanity. Are patristic theologians wrong because they did not, as Luther did, focus on “justification by faith alone” as the central message of Christianity? Based on what hermeneutic premise did patristic theologians take such a small chunk of scripture (Genesis 1:26-27) about our being made in God’s image and organized their entire theology around the renewal of this image in Christ? Sin conquered, death defeated, immortality granted – all for the purpose of becoming like Christ, in whose image human beings were created. Why this focus? Short answer: because that is what the apostles were taught by Christ and passed on to the early elders or bishops (overseers) of the church as the “regula veritatis,” the “rule of truth.” In their constant wrangling with pagan critics of the gospel—or even more importantly, with those who sought to streamline Christianity with pagan spirituality of inner transformation through knowledge (gnosis)—early Christian theologians realized that the Bible is open to many interpretations, depending on metaphysical and even cosmological assumptions we bring to the text. And in recognizing this fact, they were smarter than many modern Christians, who read the Bible as completely self-explanatory, fighting over particular interpretations as if they were the only possible ones, rather than first taking a look at the theological and philosophical lenses through which they read the text. Needless to say, the modern “sola scriptura” approach already presupposes a certain conviction about the way in which texts, reading, and obtaining knowledge work. Rather than write about all these hermeneutical issues in a theoretical fashion, we will offer our readers an ongoing series on reading Patristic texts to confront our modern outlook with the church fathers’ often quite different practice of reading the Bible. To the evangelical Christian we say: “fear not,” for you will find that patristic exegesis is all about Jesus. In fact, early Christian exegesis is more resolutely Christ-centered than much of what you will encounter in the evangelical world; this is true especially for the early theologians’ understanding of reality and their reading of the Bible as a witness to the central importance of the “Logos,” the true image of God, through whom all things have been made and in whom all things hang together (Col. 1: 15-17). 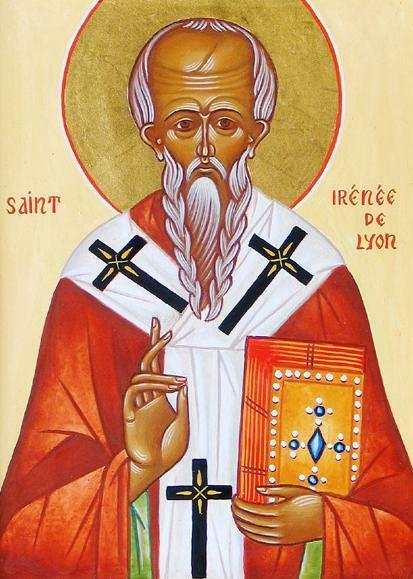 Our journey through patristic theology (which is, after all, the formation of our own theology through which we read the Bible) will begin with the church father Irenaeus of Lyon (130-202 AD). Irenaeus is not the earliest Christian theologian writing after the apostles, but he has been highly influential in the formation of Christian theology, and, through Polycarp, whom the young Irenaeus still met, he is still connected to the living apostolic teachings. We have two extant works by Irenaeus, although he wrote many more. These are his Demonstration of the Apostolic Teaching, an exposition of the apostolic proclamation (kerygmatos in Greek), and his Adversus Haereses, a long tract written against Gnostic misinterpretations of Christianity. We will begin our first reading with Irenaeus’s review of the apostolic teaching, because this text provides a clear outline of what he regarded as orthodox Christianity. The most accessible text of this short work, to which we will refer to here, is John Behr’s translation: On the Apostolic Preaching. Popular Patristics. edited by John Behr Crestwood, N.Y.: St. Vladimir’s Seminary Press, 1997. We are looking forward to your comments as we explore the faith of our (church) fathers. Augustine, Saint, Edmund (trans) Hill, and Allan D. (ed) Fitzgerald. Homilies on the Gospel of John 1-40. The Works of Saint Augustine: A Translation for the 21st Century. Edited by Boniface Ramsey Hyde Park, N.Y.: New City Press, 1990, 372. See also Augustine’s related statement that our salvation depends more on the incarnation of God than on the mighty deeds wrought by him while on this earth: “Instead, we should rejoice and be in wonder that our Lord Jesus Christ was made man, rather than that he, as God, performed divine deeds among men. Our salvation, after all, depends more on what he was made on our behalf, than on what he did among us” (Homily 17 in ibid., 305).